The sexual abuse of young children is both bewildering and disconcerting. Moreover, the overwhelming majority of young children who are sexually abused are victimized by someone they know. The impact is staggering. 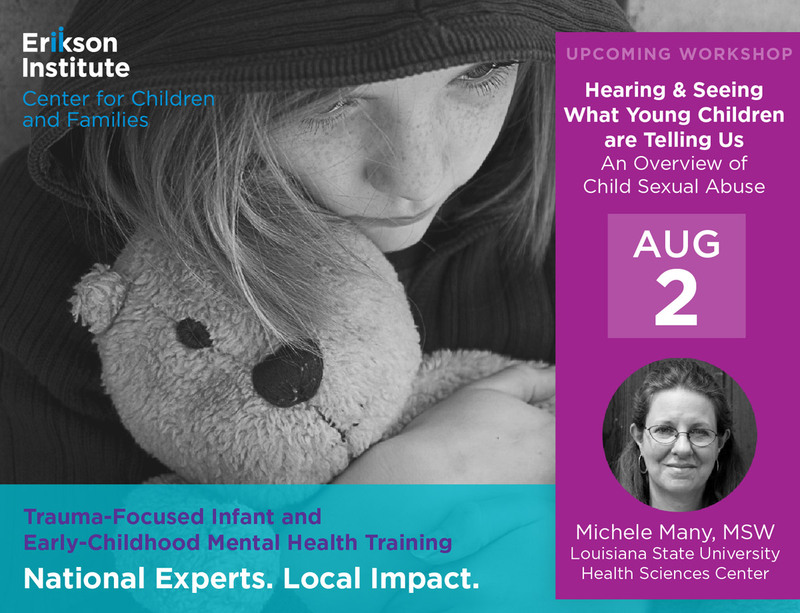 This training will focus on what is important for interdisciplinary professionals and clinicians who work with sexually abused children to know. The instructor will begin with an overview of child sexual abuse. She will discuss risk factors and the immediate and long-term effects of this trauma on young children. Participants will learn to recognize symptoms and patterns of disclosure in young children-verbal as well as through representational play. Also, the reasons young children recant will be examined. What is currently known about the perpetrators of child sexual abuse will also be addressed. Finally, the instructor will examine common parental responses and how to support protective parents. Through case examples, lecture and discussion this training will offer a comprehensive overview of the salient issues in working with young children who have been sexually abused and their families. Register before July 8, 2019, and receive $99 early-bird pricing! Price increases to $115 after July 8, 2019. Michele Many MSW is a licensed clinical social worker and is the Chief of the Section of Social Work for the Louisiana State University Health Sciences Center, Department of Psychiatry. Ms. Many is an authorized trainer in Psychological First Aid and utilized PFA in New Orleans in the aftermath of Hurricane Katrina. She is a primary clinician in several multidisciplinary teams including the Orleans Parish Infant Team, the Orleans Parish Court Team, and the Mental and Behavioral Health Capacity Project. Ms. Many’s areas of expertise include child abuse, psychological first aid, professional self-care and grief and loss.